Perfect for a game of impromptu Subbuteo, ideal for planing tactics for that next game of schoolyard footie or quite simply, a good piece of quirky design. 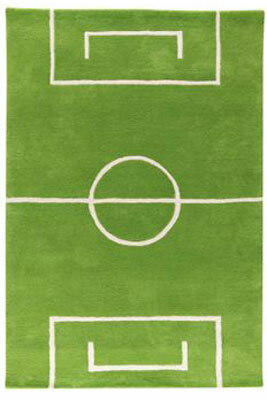 We’re talking the Football Carpet by Kateha. Yes, it’s a football pitch and a rug, although it is designed very much for the latter purpose, being sized at just 120 x 180cm. This Karin Mannerstål design is a great talking point though and a quality item too, made of 100 per cent wool and hand tufted.